The Road to Hell has been great fun!!! Rehearsing ‘The Road to Hell’ A mother cares for her war-wounded son. The work presents the unwritten stories behind this iconic battle, one of a number of brutal historical events which are still ‘celebrated’ in Ireland. The Road to Hell (The Story of the Battle of the Boyne) is the title of an original script devised and written by members of Creative Spark drama and creative writing group in Dundalk. The members will give a platform presentation in the Oriel Centre, Dundalk Gaol at 6pm, this Sunday May 19th. Facilitator/Director is Kwasie Boyce: while I have been Resident Writer/Script Supervisor. A ‘platform presentation’ is something a bit more than a staged reading but a bit less than a full-blooded, costumed production. The aim of the event is to share with the public the outcomes of this 12-week introductory community drama and local history programme. Our hope is that the performance will be entertaining of itself and will give friends and interested guests an insight into an intensive process which brought together a fabulously diverse group of people of varying ages and backgrounds from the communities of Dundalk. 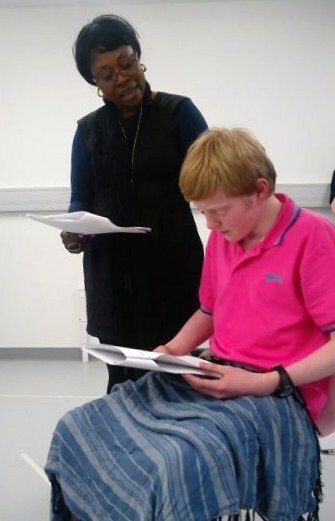 The script was devised, written and rehearsed by the participants over the 3-month period during which they received basic drama and creative writing training. The group attended a one-day workshop on the history of the Battle of the Boyne, facilitated by local historian Sean Collins, which included a guided tour of The Battle of the Boyne site at Oldbridge House. Following this, the participants began to improvise scenarios and movement set pieces, facilitated by Kwasie, and then to write scenes. Kwasie and I have now collaborated with the members on finalising a script structure and performance method. All involved, including the facilitating artists, the organisers and the participants themselves, have greatly enjoyed the experience. The project has illustrated how the creative arts can foster friendships across cultures; open up dialogue about disputed histories and ensure that the vital process of lifelong learning is one of excitement and fun. I urge anyone living in or near Dundalk, and those further afield with an interest in community-engaged art, to get along on Sunday to witness this uplifting event. The Road to Hell is a grim title and the Battle of the Boyne (and even more so the subsequent and seldom remembered Battle of Aughrim) are grim events whose repercussions are still felt, 300 years later on our fraught small island – but the work itself is full of life and zest and even some sardonic humour – and the making of it has been a tremendous joy! UPDATE: The showing promoted above went ahead and was a great success. The project was revived and the play further developed in 2014 and then toured to Orange Halls and a Presbyterian church in Northern Ireland. That remarkable trip is mentioned in my end-of-year reflection for 2014. You can read it here.